We had quite the crowd over for New Years Eve, and people were still coming in after all the appetizers and munchies had been put out and finished. There was more hectic work in the kitchen getting all of the food ready for the next step of the evening. My Bride as always was in the center of the maelstrom and enjoying every minute of the chaos. Some dishes were brought in by some of the guests and she was orchestrating the arrangement. The main part of the dinner was two of the largest tenderloins that I had seen, and we were attempting to cook them to the proper moment, to be brought out and carved. We have found over the years, that tenderloin tends to feed everyone properly and there are cuts of the meat, because of the size to accommodate all the desires of the diners from rare to medium well done. It was my job for the moment to chase everyone out, so that I could sharpen my blade and carve the two tenderloins; of course the best part of this job, is the ability to take a nibble out of each area, to make sure that they were done properly and I realize that this is a terrible position to be in (which is why I never seem to have much appetite by the time the food is all arrayed). With the entire crowd in attendance, there was only a handful that wanted red wine, which is fine, to each their own. 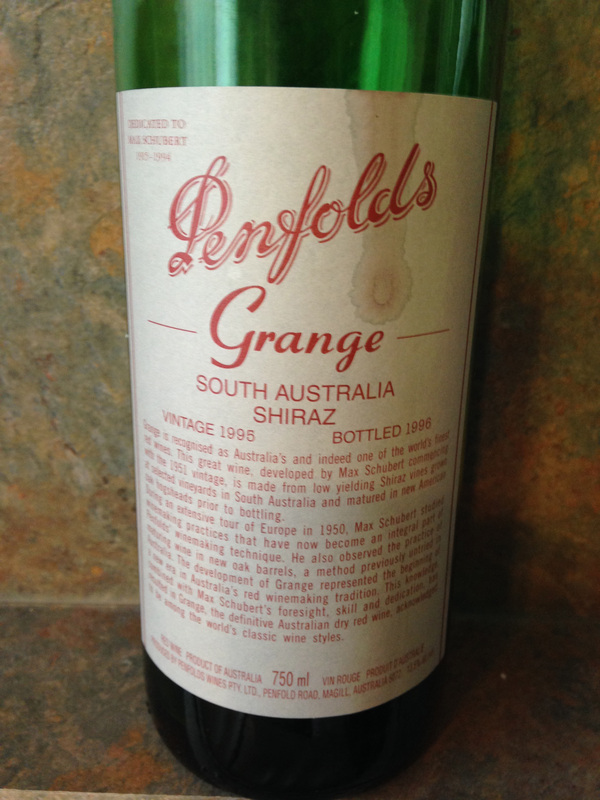 My Brother-in-Law brought from his grand cellar a bottle of Penfolds Grange Shiraz 1995 to enjoy. Penfolds is one of the fabled wines of South Australia and tends to always perk up people’s ears when they hear it mentioned. The “grange” of Penfolds Grange is what really gets them excited. The quantity of this wine varies from year to year, because it is selected from the multi-region and multi-vineyards blending of Penfolds and it is an art. It has also been mentioned that though this wine is a Shiraz, there is some Cabernet Sauvignon blended in as well. This wine can spend up to eighteen months of maturation in new American oak barrels, but this wine only spent about a year before bottling. The average years of cellaring for Penfolds Grange is twelve to fifteen years and we were enjoying one that had been cellared for about nineteen years, so we decanted it, to let it breathe a bit prior to dinner, while we were still enjoying our white wines. It has been written and opined that the ’95 vintage was considered to be developing quicker, perhaps because it was bottled so soon, but this wine was just as lovely as any other bottle of Penfolds Grange that we have had and there was no sign of being over the hill. Then it was my turn to bring a bottle up from the cellar and that always requires a few minutes of pondering when I get there. When I brought up a bottle, my Brother-in-Law told me that his wife and he both love the winery that I had selected. 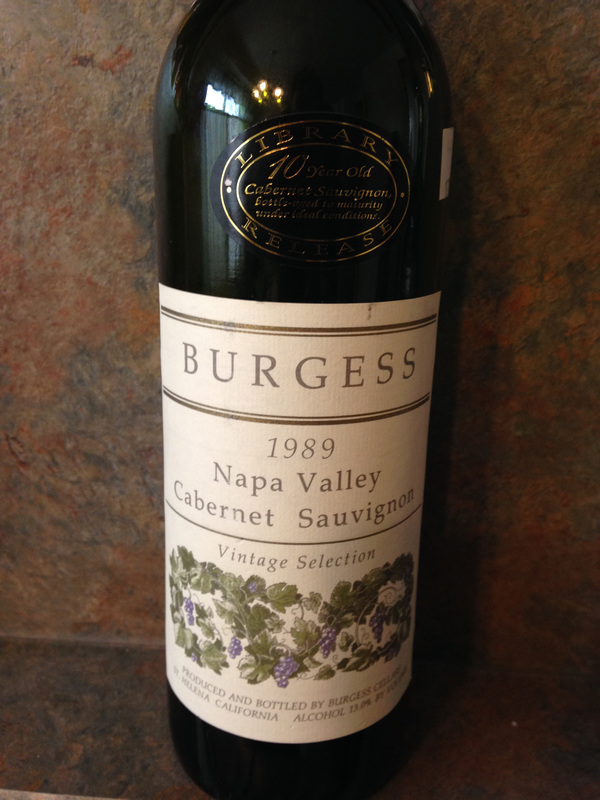 I had selected a bottle of Burgess Cellars Napa Valley Cabernet Sauvignon 1989 from their “Library Release.” There is no real set of rules as to what designated a reserve wine or a “Library Wine” in the United States, as compared to Italy and Germany and some of the other wine producing countries. This wine had been cellared at the winery in St. Helena for ten years before being introduced, and I have seen mention where this wine has been called their Tenth Anniversary wine, but to me the years don’t truly match up, but who am I to argue with other writers. While this wine is listed as Cabernet Sauvignon, I would tend to call it more of a Meritage as it is a blend of Cabernet Sauvignon, Cabernet Franc and Merlot and it was very mellow after it had also been decanted. Even though Burgess Cellars is in St. Helena they were one of the first wineries to have vineyards on Howell Mountain, which is one of the more known locations in Napa Valley. So we had a couple of wonderful bottles of red wine, and were getting ready for all of the desserts and later waiting for the ball to drop at Midnight. This entry was posted in Dining, Wine and tagged Burgess Winery, Cabernet Franc, Cabernet Sauvignon, California, Howell Mountain, Library Release, Merlot, Napa Valley, Penfolds Grange, Shiraz, South Australia, St. Helena. Bookmark the permalink. Wow! A Couple of Beauties! Michelle, thank you and it was a grand night for some wines.